Don’t ask why. When I feel nervous, overwhelmed, too busy. When I want to be able to put closure to a long project, I run back into the kitchen. These desserts. All happened between Sunday and yesterday. Every one of them. I know. Only within four days: An apple cake; a butternut squash and apple cake; a panna cotta; and a berry crumble. And we ate them all. Our friends were pleased. See the little hand? We also have a cake stealer in the family. “Mam!” she said in her own cute way when she sneaked a piece into her mouth. I laughed. And managed to snap this shot. Lucky! It’s coming next fall. It’s long. It’s been a long project. So it’d better be good. And I really keep my fingers crossed. And in the meantime, while Lulu is still napping upstairs–snoring softly–I am going back to my kitchen. And my edits. Did I tell you that I keep a bar of dark chocolate by my laptop to keep me company? Those cakes look SO incredibly (insanely) good. dear bea, i think a lot of us are as keen to see your book finally coming, and i’m wishing you all the best with the project – and your ongoing fighting – i mean sharing – with the resident cake stealer 🙂 the apple cake looks really pretty, but i love the shots of the pretty little hand attacking it! Bonne chance, bien sûr, mais j’ai 100% confiance, le livre sera certainement bon ET beau, il n’y a aucune raison qu’il diffère fondamentalement en cela de ce que tu partages ici, n’est-ce pas?! En attendant, bien beaux desserts! I can’t believe how many desserts you made! No worries. It will work out and everyone will love it. Can’t wait. Next fall as in next month or next 2011 fall? That was the sweetest of vignettes. Those desserts look lovely! I love the molds you used. So pretty! I’m crossing my fingers for you! I’m having serious cake-mold envy! Bonne chance, mais comme l’a dit Flo, il n’y a pas de doute, ce livre sera bon et beau ! These cakes look so yummy! I can’t wait to discover your book. Good luck with it! I wish you luck in this process of editing your cookbook, it must be a stressful experience. I think a lot of my friends bake whenever they get stressed because it’s one of the things we have in our control, the process is soothing and at the end of it there’s a nice sense accomplishment that pleases everyone’s palate. Can’t wait for the book – tell us! How in the world did you make the apple cakes both so pretty. Love the knobs on the first one and the scrolling design on the second one! I love the pretty cakes? Where do you get your pans from? Mold for Butternut squash and apple cake is mystery to me. Cake looks amazing. So beautiful. Can you take photo of the mold with story where you got it? Thank you. J’adore tes nouveaux moules, ils sont superbes! Je croise les doigts pour toi, mais je suis sûre que ton livre sera un succès!! good luck with the rest of your book, I’m sure you will do fine. take care. Thank you for the beautiful recipes and photography. I am presenting you with a Versatile Blogger award! Yes, please share where you got the cake molds. It all looks beautiful! I cannot wait for the book! The cake pans are beautiful. Thank you. Merci. So the molds. I purchased them during my recent trip to France. One comes from a store called 13 à table. The other one (the small taller one) was given to me as a gift by my sister-in-law. It’s nice to have people close that know me so well, and treat me with lovely items like this. Love the mould too!! so pretty. As for the book… I can understand the impatience.. I went through that too… (not for a cooking book) but it’s such a great feeling of achievement when you finally have it in your hands! And something Lulu will be so proud off (when she realises how much it actually means… like my daughter did this year and then took it proudly to school). When you say “next fall” it’s fall 2011? I thought I had read march 2011 (or spring?) somewhere…. The butternut squash and apple cake looks so divine. Sending you lot’s of good editing vibes. Wow that all looks so good. I want some of that! Fell in love with the divene-looking apple panna cotta! I’m sure every single one of us is sooo excited about your cookbook. 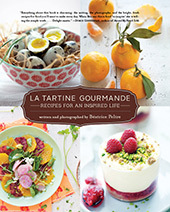 I don’t want to set too high expectations but I’m really waiting for the most beautiful cookbook ever done. Anyway, I’m sure it’s worth waiting for. Hi, Bea! Lovely photos again:) And, oh, so precious, that little hand! I have to say, I have gone on a cookbook buying hiatus UNTIL I am able to purchase yours!!!! I absolutely am dying to see it! :) Best wishes on the editing! Good luck! Can’t wait for the book. Lisa from MoreSouth organic mediterranean catering. Thank you for posting where you purchased the molds but what about the little glasses? They are wonderful. Please don’t tell me they are French too! Thanks! I am looking so forward to buying a copy of your book. To have all your collection of lovely entries in one bound unit……. Love the shapes of both cakes – beautiful pans! Bea – read your comment just now about the other mold coming from 13 a table…. thank you. Definitely a perfectly sweet entry! I’m ready for the cookbook this fall. Thank you thank you! So pleased to read that you are all hanging in there with me. 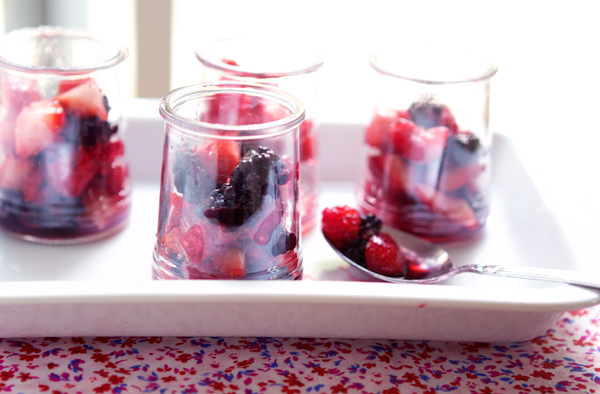 And the little glasses are recycled yogurt jars….hmmmm from France too. Sorry Mimi! the shot of the flowers was actually taken in Belle-Île en mer too. They are mixed flowers, including a lot of cosmos, some of my favorites. Those are some of the prettiest baked goods I’ve ever seen. So many of my favorites in one post! Eagerly awaiting the cookbook. also, where do you get those lovely cake molds? 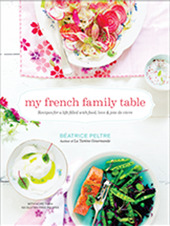 I can’t wait to buy your cookbook, and will be promoting it, myself, to my friends when it comes out. I’am always recommending your website to people who I know or don’t know. I given the websife to people at the farmer’s market, whole foods, and anywhere that gluten free is mentioned. Your webstite was the initial one that gave me hope gluten free desserts could taste good. Give that little one a hug for all those who appreciate your hard work. Thanks Bea. I can’t wait to see the cookbook!! I LOVE the pattern on the Butternut squash and apple cake ! Brilliant! Edible art! Exquisite images, as usual. Looking forward to your cookbook. Hello! congratulations! desire for revenue-lh luck with your book .. your fan from Brazil! Bea, I am all about escaping to the kitchen. Desserts are the best. Too bad my girlish figure doesn’t want too many of them, so I send them to my unsuspecting neighbors or bring them to a teacher’s room, cuz lord knows, teachers need a sweet break and they burn a gazillion calories just dealing with their students. The book editing will end some day. And you will feel….? I think it’s kind of weird when you are no longer working on edits and then, one day a million years later it seems, all of sudden, it is there. In the store. With your name on it. Wow. In the meantime, keep those desserts coming! Your posts are always so beautiful. Thank you for the inspiration! Next Fall for your book? Seems too long to wait. your book will be just fabulous just like all your posts. I would like to embark on a book too on West Coast NZ cuisine but the thought is just daunting and I still need to improve my photography. Look forward to your success though. Bonjour Bea, quand ton livre est fini, serais tu interesse de venir a Los Angeles pour donner un cours de photo/foodstyling/cooking? Tell me what your requirements are and I can work on organizing something great. if this is a preview for things to come, we are all waiting patiently! and i love the cake thief… we have lots of those little thief fingers around here too. i can’t imagine how delightful butternut squash & apples taste in a cake!!! yummm! that bundt pan & the scrolls on the squash cake are so beautiful! Wouah, tout est beau, tout est bon ! Ces petits desserts sucrés et colorés m’enthousiasment ! Et que dire de la tarte aux motifs délicats… Un régal ! Good luck with the cookbook! Yeah, if those recipes are in the cookbook, I’m buying 3!! Wow, the pictures are so gorgeous, so yummiii. With these pictures and recipes, the cookbook will be amazing. Good luck. I would also like to steal a small piece of that cake. Butternut squash and apple cake? I can’t wait for that recipe. Yum. 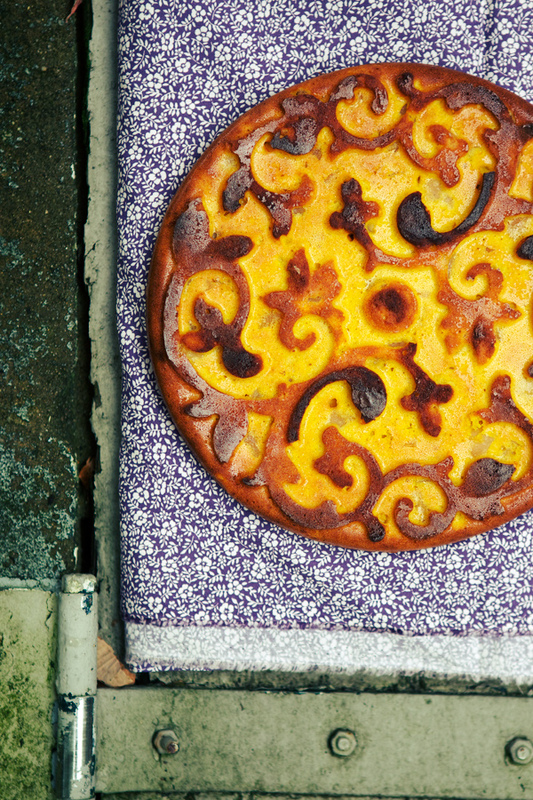 The butternut squash & apple cake looks divine – love how you decorated it. It’s always a treat to come and I never get tired !. Dark chocolate? Of course! Lindt 85% is my favorite. I am admiring the pattern on the squash pie. I helped edit a cookbook once, it was more difficult than I imagined. Every time I reread, I found mistakes. UHello I discovered your website whilst pregnant with my first child. Its amazing & I cannot wait for your book ! Will the book include metric measurements … can be tricky converting sometimes. Your website is sublime! 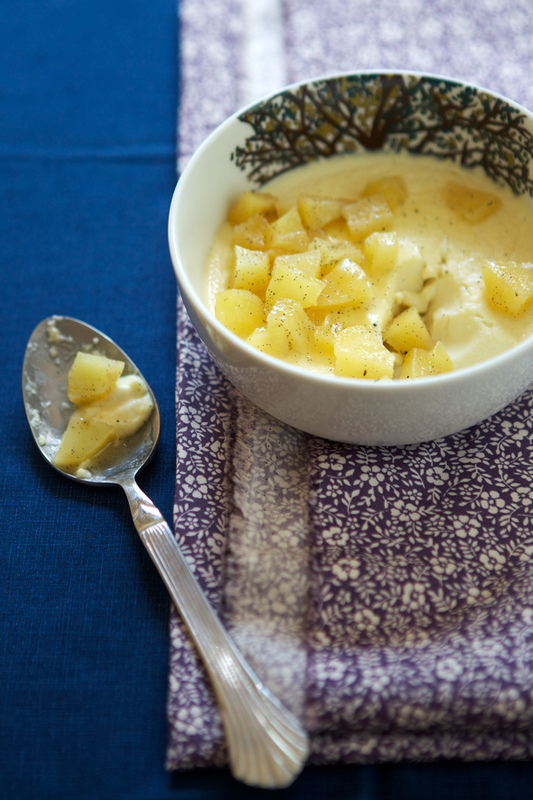 I have never heard of a dessert that sound more delicious than the vanilla-flavored panna cotta and sauteed apples. And I have never seen a cake as beautiful as the butternut-squash creation. What I love most about your work, is your “laissez-faire” attitude – what will happen, will happen – even if it’s your opportunist daughter profiting from your hard work. Best of luck and I’m going to have to buy your book as soon as it’s out so I can make that delicious vanilla delight! Those cakes are edible from the pictures my mouth is watering! Good luck with the book Bea. It’s going to be gorgeous, just so beautiful! I completely understand feeling like your book will never be done! The editing phase is so difficult…I too kept a bar of chocolate next to my computer, especially for those days I just wanted to cry. 🙂 You will get there! All of the hard work will pay off. I will be first in line to buy! I am amazed that despite all the work you have, you can write such beautiful posts and take such amazing photography. Bravo! Ooo another year to wait for your book… *deep sigh*… But as someone already said above here that good things are worth waiting for! I can’t wait. I can’t wait. I can’t WAIT!!! I guess I know what will be on next year’s Christmas wish list! Nous habitons Insviller (à 10 km d’Albestroff) et venons de lire un article vous concernant. Nous nous sommes donc précipités sur votre site pour en savoir plus sur vos délicieuses recettes. Pas de bol, toute la documentation est rédigée en anglais… dommage. Le même site existe-t-il en français ? Nous vous souhaitons bonne continuation dans votre aventure culinaire et vous adressons nos plus cordiales salutations mosellannes. The last cake is simply beautiful. Absolutely love your photos and the presentation is, well, I am speechless. I want your cookbook!!!! I hope that when I make your recipes they look as special as your pictures. I am proud of you!!!! Love your book, and only wish it had the recipe for the apple and butternut squash cake, which is so beautiful. PLEASE give us your recipe. Thank you for everything you give us.